About 4 years ago, I was given a beautiful Bombay Co tea sampler chest (I love tea, great gift!). Here is an idea for what to do with the chest once it is empty! 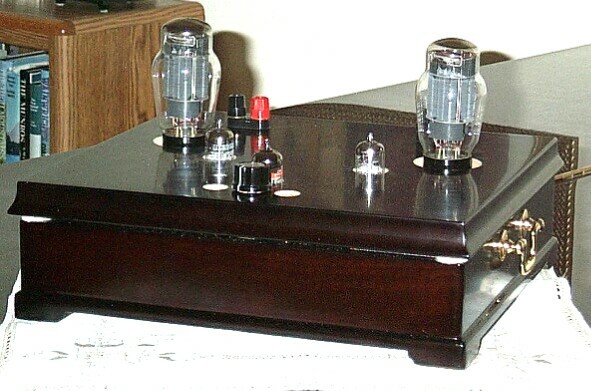 This amp was conceived to be low cost, small and light. The parts cost is around $250, the tea chest is 12.5"x11.5"x3.75" and it can be picked up using one hand. As usual, a regulated PSU is used. This approach permits a very quiet B+ without the weight and cost of choke filtering. It makes 10WPC in Class A. (Using 92dB/W/m speakers, it makes more sound then I can stand.) The sound quality is surprising, quite SE like until the program density gets very high then it sounds like most PP amps, a bit confused. (If one considers that music is electrically a complex presentation of sinusoidal fundamental frequencies and harmonics of differing amplitudes and phases, it stands to reason that there is a limit to how well a push-pull output transformer can accurately maintain the para-phase summation process. Thus as the density of the fundamentals and harmonics increase, the process breaks down more and more.) I am pleasantly impressed with the 6AS7 as an output tube. Of course, Ralph Karsten realized this years ago.